I have a plan. I have organized my plan into ten points. Ten rules. Ten basic guidelines. If implemented, I believe the Disney parks will offer better experiences and better environments. The plan focuses on better placement of character-based attractions yet all types of attractions and their surrounding lands will benefit from this plan. All types of guests will also benefit. Let's intelligently approach what might be considered a silly topic. It's a topic I believe to be crucial in maintaining the high standards and integrity of the Disney theme parks. It's a topic that is endlessly debated. I believe there are excellent solutions that require very little compromise from either side of the debate. One of the biggest arguments amongst serious fans is the argument of character placement. I’m not referring to walk-around meet-and-greet costumed characters making temporary autograph-signing appearances (although I will address that later on). I’m talking about permanent character-based attractions. One side of the argument says, “Characters are fun no matter where you put them” and “People come to the parks because they want to see Disney characters” and “It’s all just for fun anyway”. The other side says, “Characters are great, but like everything, they should be put in the appropriate locations” and “Character additions to non-character locations change the way those locations feel” and “A certain level of integrity and cohesion need to be maintained”. When discussing this issue a while back I was told, “Thank you but I like my attractions Disney-themed”. My immediate thought was, “Aren’t they all sort of ‘Disney-themed’?” Then I said, “So you don’t like almost anything outside of Fantasyland?” This person for whatever reason associated all of Disneyland with the Disney characters and failed to recognize the many non-character offerings with which, ironically, she was also obsessed. A gift shop coworker of mine once explained that no rhyme or reason need be applied to anything in the Magic Kingdom because “it’s Mickey’s park and he can make anything happen with Pixie Dust.” I’m sorry but that’s a poor way to manage a classy theme park. And that’s not how Pixie Dust works. Starting in 1955, characters from animated feature films were not permanently placed in any land outside of Fantasyland. Original characters like Tiki Birds and Country Bears were introduced outside of Fantasyland but these were created for these types of environments specifically. Live-action franchises like Davy Crockett, Swiss Family Robinson, and 20,000 Leagues Under The Sea were permitted outside of Fantasyland. Characters from corporate sponsors like the Frito Kid, Aunt Jemima, and the Kaiser Aluminum Pig were also permitted. Pecos Bill, from the 1948 short film, was a part of the Golden Horseshoe and Wally Boag’s brilliant show. Gift shops sold character-based items. Character parades regularly wove through the park. But at the end of the day, Fantasyland was the only home for permanent characters. And it worked. It wasn’t until 33 years after Disneyland opened that the temporary Mickey’s Birthday Land opened at Magic Kingdom in 1988. In 1989 the very permanent Splash Mountain opened in Disneyland’s Critter Country and in Magic Kingdom’s Frontierland in 1992. In 1993 Mickey’s Toon Town opened at Disneyland. And so began the placement of permanent character attractions outside of Fantasyland. By the end of the decade both Aladdin and Tarzan films inspired permanent changes to significant parts of Disneyland’s Adventureland. Toy Story’s Buzz Lightyear had his own ride in Magic Kingdom’s Tomorrowland. In the new millennium in all sorts of similar changes occurred. Monsters Inc. monsters and Finding Nemo fish moved into lands celebrating the future. A colorful Aladdin spinner ride was plopped in the middle of the jungle. A smart-talking bird from Aladdin teamed up with a bird fromThe Lion King and together they “managed” to repeatedly verbally abuse the former classic attraction they occupied. (They have since been evicted). And the list goes on. Interestingly only about 50% of these “reimagined” locations remained popular for any real amount of time. I worked at Disneyland in the late 90s. Disneyland President Paul Pressler (and many others) at the time talked about how everything should be tied to the Disney films. Everything? I would consider any classic attractions to be just as iconic as any film threatening to tie itself to it. Wouldn’t you say? Today, CEO Bob Iger speaks of major film franchises being the best way to expand the Disney theme parks. This idea is the foundation on which the Avatarland plans stand. This is no doubt largely inspired by the huge success of The Wizarding World of Harry Potter at Universal's Island of Adventure. Harry Potter fits nicely into the pretty open theme of “Adventure”. Does Avatar fit the more specific Animal Kingdom theme of “Animals”? Hold on... Now I’m speaking of a third-party live-action film. This will also be included in the plan. You may be asking, “but what about the latest successful animated film? It doesn’t fit perfectly but it deserves a place in the parks.” My plan addresses this as well. • There is potential for big money and lots of fun when it comes to movie tie-ins. • Move tie-ins are not immune to failure. • Character rides are an important part of the parks and always have been. • Something does not have to be linked to a movie or a known character to be hugely successful. Most of Disney’s keystone attractions need no tie-in to be successful: Space Mountain, Big Thunder Mountain, Matterhorn, Haunted Mansion, Jungle Cruise, Tiki Room, Pirates of the Caribbean, “it’s a small world”, Soarin’, Kilimanjaro Safari, Expedition: Everest, and so on. The solution comes down to one thing: ORGANIZATION. How do we best organize everything so that everything fits nicely, integrity is preserved, and everyone still gets to have loads of fun? • Should every land and every park strive to fill the needs of every type of fan? Is that even possible? • Can there be rules that say that something is never permitted in one place but is absolutely permitted in another? • Can certain lands or even entire parks have significantly more relaxed rules than other lands or parks? Think about these for a minute. Before I go any further, allow me be clear on one thing. I absolutely love animated feature films, animated short films, and television animation. I studied animation in school. I treasure the memories of my visits to Disney, Pixar, Dreamworks, and to other animation studios. I regularly watch animation of all kinds. I worked as a Disney Character Artist for a time and absolutely loved it. My wife was a Face Character Performer at Walt Disney World and at Hong Kong Disneyland. I love Disney animation. It is my love for these things that strongly enhances my desire for better organization within the theme parks. What About Meet-and-greets, the Non-permanent Characters? It would be irresponsible to not address this topic as well. Costumed characters have always appeared in the parks (EPCOT Center being a slight exception for a time) and I think they always should appear in the parks. Their appearances should be fitting though. Timon doesn’t need to be in turn-of-century American Main Street, U.S.A. I don’t think Tinkerbell needs to hang out in Future World. The semi-permanent meet-and-greet backdrops, like everything else, should not visually disrupt their surroundings. Their designs and craftsmanship, like everything else, should be on par with the world class environments that surround them. Meet-and-greet sets should blend in so well that when no character is present, the set doesn’t look like a set. If no designated set is available, characters can stand in front of appropriate existing structures or landscaping. Very simple yet very effective. At some point while reading this blog post you may have thought of certain guest needs. Perhaps you thought of the need for plenty of character-based attractions for kids. Maybe you thought of the need to not take the parks so seriously. The topic of “needs” can quickly ruffle feathers on both sides of any theme park argument. On one side someone will use a need as justification for something that the other side considers to be sub-par. It seems that the ultimate excuse for poor design is that “it fills a need”. The clash between the design-focussed fans and the operations-focussed fans seems to be never-ending. Might I suggest That Good Design and Efficient Operations Can Nicely Co-exist? Example 1: Space Mountain. After Matterhorn’s huge success as Disneyland’s first thrill attraction, there was a need for another thrill ride. Space Mountain was built at both Walt Disney World and Disneyland. Its design, layout, locations, and theme were beautifully and seamlessly brought together to not only fill an operational need but to also fill the design needs of both Tomorrowlands. Example 2: Disneyland’s Casey Jr. Circus Train. It meets the needs of small children yet looks great, is well-designed, well-built, fits beautifully, and can be enjoyed by all ages. The all-too-common (and unacceptable) excuse of “it looks terrible but that’s ok because the kids like it” isn’t needed here. A young and ambitious self-proclaimed “future Disney executive” once told me, “Disney HAD to build the Value Resorts”. Their tacky designs were of no concern to this young man because the Value Resorts fill a need. They do fill a need. But could they have filled a need and showcased better design? Everything should be well-designed. Everything should be put in the right place. After all, good and appealing design just might be the most important factor in Disney’s 85+ year success. Too expensive to design and build somthing well? Then don't built it. Build it when it can be done well. 1- EXPAND FANTASYLANDS. Expand Disneyland’s Fantasyland to the northwest as needed. This will accommodate new attractions based on animated feature films and animated short films (The short films need some love too!). Continue current expansion of Magic Kingdom’s Fantasyland, as planned, with the future option of expanding to the northeast if needed. 2- EXPAND CRITTER COUNTRY AT DISNEYLAND. There is little room for expansion but one more family-friendly offering here would lighten the load over in Fantasyland a bit. My suggestion: An attraction I designed called Country Critter Jamboree. Imagine Country Bear Jamboree but with all sorts of critters putting on a show (maybe in a carousel theater??). 3- CREATE A CRITTER COUNTRY AT MAGIC KINGDOM. Include Splash Mountain and the real estate to the west and northwest. This fun-for-all-ages expansion would allow youngins who can’t yet see the critters inside Splash Mountain to see some critters elsewhere. My suggestion: Two attractions I designed called Critter Canyon Railroad and Critter River Expedition. One is a Casey Jr. Circus Train-style train that repeatedly intersects with a slow Storybook Land-style boat ride. Both are set in a land full of critters and critter habitats. Picture little houses, caves, other critter dwellings. The train would look like it was built by animals with natural forest materials in addition to some old abandoned railroad parts they’ve come across. The boats would look like wide canoes carved by beavers. The boat ride would pay subtle homage to the never-built Western River Expedition that was once intended for that side of the park. 4- “ANYTHING GOES” AT HOLLYWOOD STUDIOS AND CALIFORNIA ADVENTURE. Relax the rules of both parks. These parks have many similarities. Both can accommodate a wide variety of themes. California Adventure has a pretty open theme of “California” and Hollywood Studios has a pretty open theme of “Hollywood”. Both seem to welcome the current trend of PIXAR PIXAR PIXAR! and the Pixar films seem fit better in these parks than in any of the other parks. I’ve been known to call DHS and DCA “perfect dumping grounds” for anything new-fangled or trendy. “Dumping grounds” is not the right term for two parks that have potential to be pretty great places, but you get my point. So DHS and DCA, go nuts! Let the movie-based offerings fill your borders. Let’s just make sure everything is designed and crafted well. And organized pretty well. Avatarland at DHS? Sure! 5- HIGHER STANDARDS AT DISNEYLAND AND MAGIC KINGDOM. Designate Fantasylands, Critter Countries (Rules 3 and 4), and Mickey’s Toontown (Disneyland) as the ONLY places in these two parks to house any permanent character-based offerings. This would require the removal of character rides in the Tomorrowlands, Adventurelands, Frontierlands, etc. Remember, this does not include characters like Country Bears, Tiki Birds, Haunted Mansion ghosts, etc. who were designed specifically for these types of environments. 6- MAKE EPCOT SOPHISTICATED AGAIN. Return the Figment and Dreamfinder duo to Journey Into Imagination and improve the attraction to its original level of entertainment and quality. Figment needs to not only host a great ride again, he needs to represent Future World in a more important way. Remember his role back in the day? As for a “fixed” Journey Into Imagination, I’ve heard some promising rumors very recently from some very legitimate sources. Sorry, I don’t have more to give you than that. 7- NEW LAND AT ANIMAL KINGDOM. Build an animal-focussed Fantasyland-type “kiddie” land. Quality dark rides, spinners, and other family-friendly attractions can be based on the many untapped animal-focussed animated films in Disney’s library. Jungle Book, Tarzan, Robin Hood, Lion King, even The Sword in the Stone, etc. could all exist in a similar way that Peter Pan, Snow White, and Pinocchio exist in Fantasyland. This land would be nicely tucked away and not visible from other lands. Additionally, build only animal/nature-related attractions in the rest of the park. 8- PIXAR-BASED ATTRACTIONS PLACED ONLY IN DHS AND DCA. So far Pixar has a stellar 12-film lineup that should not be ignored. As stated in #4, Pixar films fit quite nicely inside DHS and DCA. For some reason they don’t fit as nicely in say, Tomorrowland or in Epcot. Now, there is definitely some wiggle room in this rule. I write this rule without knowledge of future Pixar films. The day may come when Pixar makes a film a about critters, for example, that would fit nicely into a Critter Country. Perhaps a Finding Nemo attraction would fit in the Fantasyland-style land I proposed for Animal Kingdom in #7. (Maybe the attraction pieces can be moved over from Epcot! Win-win). 9- FUTURE ATTRACTIONS BASED ON THIRD PARTY FILMS TO BE BUILT ONLY AT DHS AND DCA. We shouldn't be foolish enough to think that more third-party films won't make their way into the parks. We've seen much success with attractions based on Star Wars, Indiana Jones, The Muppets, etc. Inevitably some of the Marvel lineup will be introduced to the parks. This rule and rule #4 go hand-in-hand. Want an Iron Man ride? Sure. That can be exciting. Let's put it in the park that celebrates all-things-movies. Or in the park that embraces pretty much anything. The Tomorrowlands and Future World don't need to be hodgepodge lands when we have two hodgepodge parks. Just design and build these things well or don't build them at all. 10- E-TICKET TREATMENT TO A, B, C, AND D-TICKET ATTRACTIONS. Lastly, a rule about overall quality. Attractions large and small are important. The enormous scale of Splash Mountain does not need not be applied to a small ride like Dumbo but the level of quality should be the same. The title of this rule is inspired by FoxxFur's Passport to Dreams article entitled "Lighting in a Bottle? Storybook Circus". FoxxFur discusses the charm of "C-ticket rides with E-ticket trimmings". I also refer you to Adam Roth's photo report of the recent New Fantasyland soft opening. This level of craftsmanship has been seen very few times in the past deacade and a half. 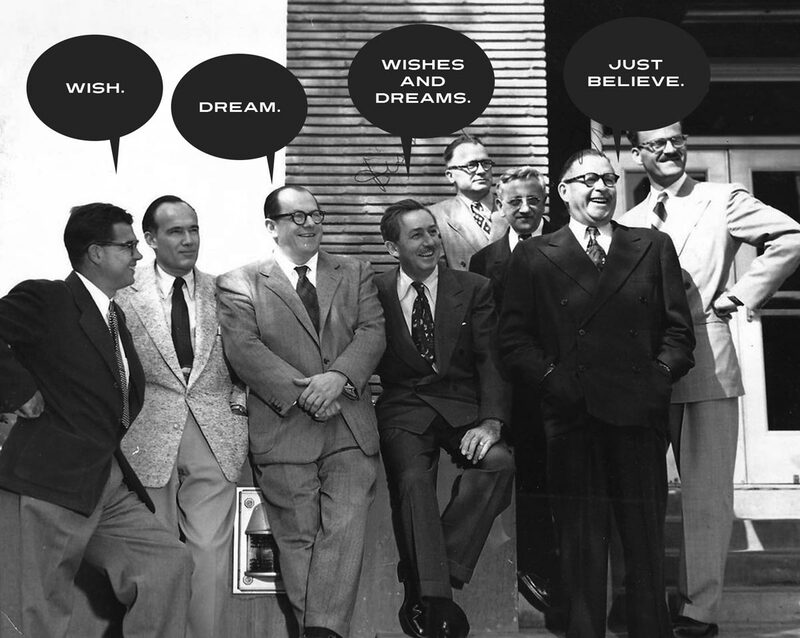 A plan that can be fully-implemented by say... Walt Disney World's 50th Anniversary in 2021? I believe this offers solutions for all types of fans and requires very little compromise from either side of the debate. Want more characters? You get them. Want no more mindless cartoony overlays on top of classic, sophisticated themed environments? You've got it. Want only movie-specific offerings? Great. And less walking is required. Why Ludwig in the header image? He's both intelligent and fun. Why the Decline in Park Maintenance? Words cannot describe the passion I feel about how important the upkeep of all Disney Parks is to me. I write specifically about Disneyland and Walt Disney World. When I was young I used to walk around the Disney parks in complete amazement at how incredibly spotless the parks always were. No chipping paint, no gum on the ground, not even a candy wrapper could remain on the ground for more than a few seconds before it was whisked away by a smiling custodian. The most impressive instance I experienced was at Disneyland over the millennium. I remember looking around the parks on New Years Eve in astonishment and horror. The park was at capacity, tens of thousands of people were crammed into every corner of the park and they had trashed the place. After the countdown and fireworks, I saw that in order to get a closer spot to see the fireworks, the crowds had trampled every flower bed in the hub area. Garbage was everywhere: party hats, confetti, popcorn. Not only were the queues destroyed, but the rides themselves had trash and crap thrown everywhere. The mummy chamber in the Temple of the Forbidden Eye had confetti all over, I remember someone had thrown a box of popcorn all over a scene in one of the dark rides. Not only was the park trashed, but it was open until 3am that morning, leaving cast members a mere 6 hours to attempt to get that park looking half way decent before the park reopened at 9:00am the next morning. That was the last time I had that experience. Here are a few shots of what the parks look like now. 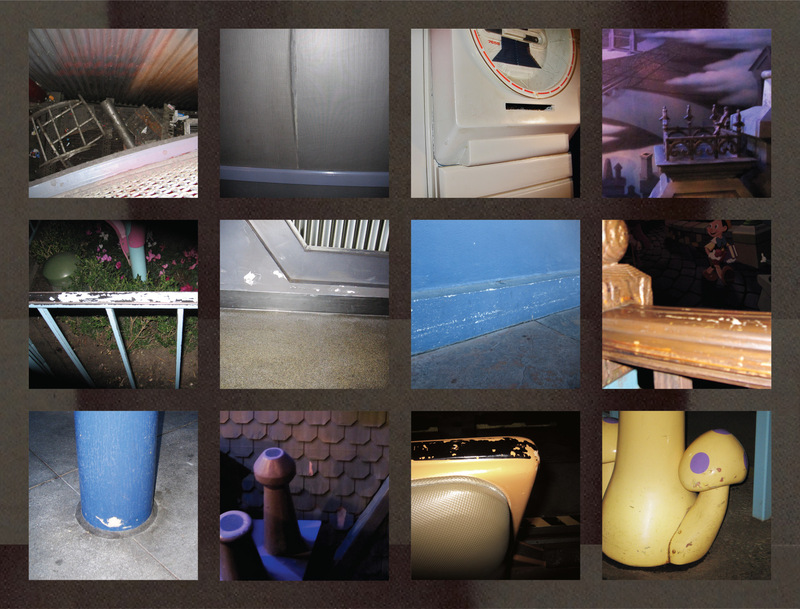 These shots are from Disneyland, but I can assure you I have plenty from Walt Disney World as well. You may wonder, what happened? How could a company go from being completely meticulous to seemingly careless? Well, the problem really isnʼt a terrible secret. The fact is, it all comes down to money, management and a change of culture. A well-tenured cast member once told me that they used to completely renovate each park every few years. The last time they did this several years ago, it costed them upwards of 5 million dollars to renovate the Magic Kingdom alone to the extent they had in previous years. Simply put, people high up in the ranks decided it was no longer cost effective to put that much money into the upkeep of the parks. This is a big one for me. The complete lack of a competent management staff has lead to more problems than just the lack of upkeep. I cannot count the amount of times I have seen cast members assigned to cleaning or maintenance lounging around, taking ridiculously long breaks, or even sleeping on the clock. Not only does management not seem to understand or teach structure and work ethic, but they lack positive reinforcement and encouragement as well. This can easily be seen in the faces of todays cast members. versus what they have now, how things worked, and what maintenance was required for all the attractions he worked on. passionately about the subject as I did. He said he used to come to work with excitement, joy and enthusiasm to work on these amazing attractions. He felt respected and knew how important his job was. However, the past few years had changed him. He told me there are only so many times you can turn to your superiors and tell them what needs to happen and where money needs to go before you realize your thoughts, opinions and years of experience are falling on deaf ears. Itʼs hard to care about something your superiors couldnʼt care less about. It hurt to care and after a while he couldnʼt care anymore. Few of his coworkers had worked there as long as he and the new ones picked up on the apathy quickly. So, it continues downward without anyone to stop this dismal cycle or the deterioration of my beloved parks.